An online presence is a great asset to you and in fact, many in the industry would say that it is now essential to show that you have shown engagement in some kind of online community. When you are doing any kind of online promotion, it’s important to have a landing page to link to that contains information on who you are and where to buy your books. You don’t have to spend lots of money on having a website built. You can try your hand at it yourself using sites such as Wordpress, or even just piggyback on a blog page – it doesn’t matter. However, bear in mind that the website will probably need to be updated fairly regularly so make sure there is some way that you, or another person can make changes later on. Ideally, you should name your website with your author name (so it’s easy to find). When it’s live, link to it in your tweets and posts as much as possible (as long as it’s in an appropriate, rather than spammy way!). Good example of an author website is Tony Robinson’s website. It informs you about his non-fiction book ‘Freedom From Bosses Forever’ right on the welcoming page. The website uses big, clear lettering to attract your attention and is consistent in its colour use too. A blog can be a particularly good promotional tool if it contains lively and up-to-date information. Having a blog has two main advantages. 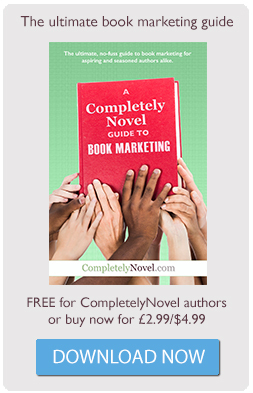 The first is that it is a great way of attracting new readers to buy your books. A blog is an opportunity to give your readers a taste of your style and convince them that they want to see more of your work. A blog or a website offers a great way to keep your readers informed of what you are up to and maintain their interest in your work, so they are more likely to buy the next book you write. You’ll have the opportunity to interact with your readers and get feedback quickly and easily. Some authors decide to focus all their efforts on one social media profile such as a Facebook page because it is easy to update. You’re far more restricted in what you can do with a Facebook page vs. a website or blog, but at least it will be current. Give yourself time to explore different options before deciding. You can use your profile page on CompletelyNovel to tell people a bit more about yourself and your books and link to your website or blog if you have one. Some places to start a blog include Wordpress, Blogger and Tumblr. Update it regularly – Don’t write anything for the sake of it (after all it has be worth reading!) but the best blogs tend to be the ones that are kept current and fresh. Develop your own voice – whatever the tone you take (witty, warm, sarcastic…we could go on for a while) make it distinctive and it will reel in those readers who will look forward to each new update. Make it easy on the reader – that’s not to say that you should only write about simple topics, but keeping it fairly short, using subheadings and avoiding jargon makes it much easier for people to skim read, before they settle into the detail. Use lots of links – it enriches the experience for the reader if they can click on a link to immediately find out more on something mentioned or referenced in your post. Don’t take it personally – you may receive comments on your blog from people disagreeing with your opinions. Don’t take yourself too seriously and enjoy the debate! Sam Starbuck explains how having a blog can improve your writing.